February 10, 2011 is a day I will never forget. Many times I write and have tears. This is not different, but today they are because of pure joy. I got to be a part of a family reuniting that had not been in contact with each other for over 20 years. I am hosting a family who just arrived here from the camp in Kenya. The father is from Soddo and… has 2 brothers and hopefully his father as well is still there in Soddo. His father was a well known evangelist in Soddo who also ran a medical clinic. He has not seen them in many years and would like to let them know he is ok and has 2 daughters. Is there any way you can help me or refer me to who can help me find his father and brothers in Soddo? This came from Jim, a man who works with refugees and is helping the family settle in America. After spending seven to eight years in Somalia and then 13 years in a refugee camp in Kenya, Dawit and his two daughters flew into Boston on January 21, 2011. When Dawit and Jim googled Soddo, they found my blog. I was eager to help. Jim sent all the information he had: the names of Dawit’s father, two brothers and his two sons in addition to his father’s previous workplace. I brought the information to the administration at our hospital. One of the gentleman said he knew of Dawit’s father and knew who to talk to to find him. There is no such thing as a phone book here. Everything is by word of mouth. You go to the churches, mosques, or neighborhood associations and ask if they know them. I also asked all of the Ethiopians I know if they knew his family. The lovely girl who works at my house, Groomnesh, said she knew one of his sons…. or so I hoped. Same name, wrong person. Monday morning while I was rounding and making farting noises to ask my patient if she was passing gas after her surgery, I was interrupted by Gabayu, a man in the administration. He said, “I want you to meet some people. This is Daku, Dawit’s father, and his two brothers.” I couldn’t hold back my tears and hugs. It is a hand shaking and shoulder touching place, but I am just a hugger. I brought them to my house and showed them the picture of their long lost Dawit. They told me it had been 21 years since they had seen him and they didn’t know if he was dead or alive. 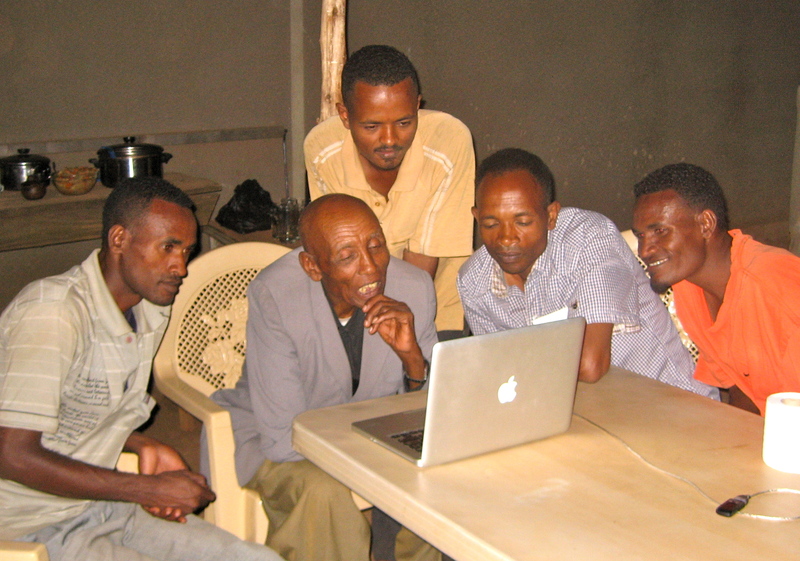 I invited them to skype with Dawit. They had no idea what skype was, so I introduced them to it by calling my mom. We sent an email with a picture to Jim and Dawit and waited for a response. Thursday night, we finally had a time that the family could reunite. Dawit’s father, two brothers, one of his sons, a cousin, Sophie and I sat outside staring at the computer screen as the phone rang. I cannot explain to you how amazing it was. Shortly after we got on Dawit was telling his family what the last 21 years of his life had been like. All six men were brought to tears. Almost all of the conversation was in Wollaita, their tribal language, so I missed most of the words, but their faces told the story. I can just give you a snap shot of it. Daku, Dawit’s father is 83 years old. Dawit never thought he would see his father on this earth. The average age life expectancy for a man in Ethiopia is about 52 years. Daku said several times that this is like the reunion of Jacob and his son Joseph. Buruk, Dawit’s son, was about two when his father left. Buruk has no memories of his father. 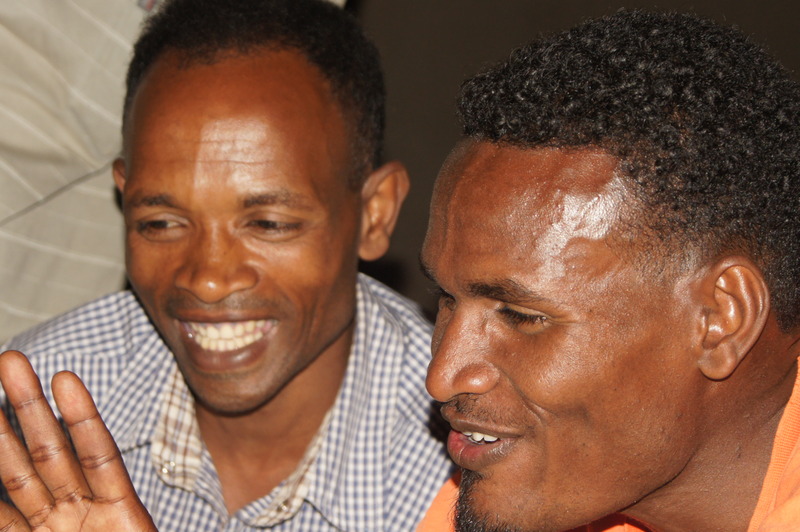 Dawit asked his several times, “Who is your father?”, “Tell me stories about yourself.”, “Come closer to the camera. I want to see you.” Buruk also got to meet the two sisters he never knew he had. They didn’t speak Wollaita, but they spoke Amharic, the national language, so the siblings were able to communicate. The reunion lasted about two hours with only a few internet glitches. It was dark and the men here needed to go. They walked away with an extra hop in their step and many praises to God. Wow, Stephanie, I can hardly even imagine how thrilling and emotional it must have been for you to be a part of that reunion! It sure brought tears to my eyes! It’s so exciting to see how God is using you in so many different ways there! We’re still praying your license issues will be worked out, too! Hurray! Such happy news Stephanie! Way to keep His work in motion! UUUHMAZING!! so incredibly cool steph! I’m so happy you were able to be a part of this. What a neat experience and yay for amazing technology!! Wow Stephanie, how beautiful! Amazing how God can use technology. Wonderful story of grace. Thanks for sharing and so glad for your gift of joy! As Steph’s mom I can attest to what she is saying. The evening Dawit’s family got on Skype with me, as soon as the video lit up for them to see me there was excitement all around. I am sure that they were amazed just by the realization that they might really see their own family member. They were almost giddy with excitement. Though we couldn’t speak the same language, the language of the heart ran deep. As a mom that can only imagine the pain involved in “losing” a family member, I can tell you that I have wept with a joyful heart every time I think of this event. What a gift! I love you Steph!!! Steph, I think that God blesses your work and your social connections to remind you that He hasn’t forgotten where you are. He is preparing everything, step by step, for each new day. I love you! Steph, I think that God is blessing your work and your social interactions to remind you that he is still working out, day by day, the steps you are to take. What a wonderful day you had! We miss you here. I love you! Sorry for the repeated idea. The website told me it wasn’t taking the first message. Oh Steph, How Awesome! What a fantastic and overwhelming experience for everyone! I’m so happy you were able to be part of it and helped reunite this man with his family! You were long overdue for some extreme joy! God is Amazing! You have the perfect heart to help God bring this family together. So excited! I am crying too. Keep us posted on their story! I LOVE IT!!! That post put the hugest smile on my face, pure joy I am sure. Wow Steph!!! You are truly amazing. I hope they know how lucky they are to have you not only for your medical knowledge but for the wonderful person you are. Hope to hear soon that your license has been approved. What a long drawn out process this has been. Amazing story, Steph! How wonderful that you got to be part of it. I am constantly amazed at the ways God uses you…wherever he places you. You have such a gift of compassion, and I know events like this only affirm your belief that you are where God wants you, (even though the license still hasn’t come through). WOW!!! Steph, what an amazing story. God is good, all the time, all the time, God is good!!!!!!!!!!! !